Artist's illustration of a classical nova system just before an explosion on the surface of the white dwarf. Classical novae occur in a system where a white dwarf closely orbits a normal, companion star. 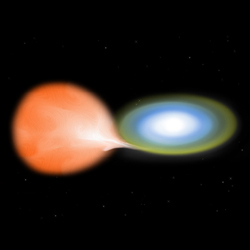 In this illustration, gas is flowing from the large red,companion star into a disk and then onto the white dwarf that is hidden inside the white area. As the gas flows ever closer to the white dwarf, it gets increasingly hotter, as indicated by the change in colors from yellow to white. When the explosion occurs, it engulfs the disk of gas and the red companion star. Credit: NASA/CXC/M.Weiss. A nova is a type of cataclysmic binary that undergoes a sudden, spectacular brightening, by a factor of up to a million or so, before dimming to its pre-nova state. Far from being "new" stars, as their historical name suggests, novae consist of a white dwarf primary in close orbit around an orange or red dwarf or (in some cases) giant secondary, the fuel for the outbursts being gas plundered from the larger star by the white dwarf. In complete contrast with supernovae, which are one-time events accompanied by the total destruction of a star, novae leave the host stars essentially intact and capable of repeating the show. How often a nova recurs, together with the details of its behavior, determines how it is categorized. There are three main varieties: classical novae, recurrent novae, and dwarf novae. The first two of these probably have a similar underlying mechanism and will be dealt with further here. For more on dwarf novae, see the separate entry on U Geminorum stars, which is the name by which these objects are more specifically known. • Fast novae rise very steeply rise to maximum, stay at maximum for a few days at most, then decline, rapidly to begin with (typically fading by a factor of 10 in three months). The fading may involve a prolonged series of marked fluctuations. A classic example is Nova Persei 1901. • Slow novae rise gradually to maximum, then remain there for several weeks or months before declining. They tend to fade slowly at first with fluctuations, after which the rate of fading quickens. As these novae continue to decrease in brightness, it is common to see them brighten slowly and irregularly to a second maximum, followed by a return to the minimum state. A factor-of-10 dimming from maximum typically takes 150 days or more. Some slow novae show a deep, wide minimum about 2 to 5 months after maximum, which may be due to dust condensation that blocks the visible light. As the ejected material dissipates, the nova recovers to a brightness approximately equal to that expected in an undisturbed decline. Nova Herculis 1934 is a well-known example. • Very slow novae are a small group with maxima that extend over years and with declines that also take place extremely slowly. In 1915, RT Serpentis, the first of this type to be observed, rose slowly to magnitude 10.5, remained at this level for almost 10 years, and then began to fade very slowly, reaching magnitude 14 in 1942. Very slow novae are also referred to as symbiotic novae or RR Telescopii stars. Closely related to classical novae are recurrent novae, which show similar or slightly lower levels of brightening but have been seen to put on more than one display. In the final analysis, all novae are probably recurrent if observed over a long enough period. The seven known examples of recurrent novae cover a broad spectrum of behavior, showing brightness increases of 4 to 9 magnitudes and intervals between outbursts of 10 to 100 years. A well-studied example, RS Ophiuchi, varies in magnitude from 12.5 at minimum to a 4.8 at maximum, when it can be seen with the unaided eye. Over a century of observations, it has erupted five times – in 1898, 1933, 1958, 1967, and 1985. Typically, it rises to peak magnitude within 24 hours then returns to minimum over 100 days or so, brightening slightly around 700 days after the onset of the outburst. The intervals between outbursts seem to have no common period and, at minimum, the light curve shows irregular brightness variations of between 1 and 3 magnitudes. Other examples that tend to have outbursts every couple of decades or so include the Blaze Star (T Coronae Borealis) and U Scorpii (which was last seen to erupt in January 2010). On the other hand, T Pyxis has a much slower recurrence time of about 80 years. These differences have led to the idea that there are two kinds of recurrent novae. Type A, exemplified by T Pyx, result from thermonuclear runaway on the white dwarf primary, and are just classical novae that have been observed in more than one out burst. Type B, by contrast, may be driven primarily by instability and eruptions in the accretion disk, and so have more in common with U Geminorum stars.